Why Haven’t You Gone to College? I run into this situation more often than I’d like to admit. The conversation doesn’t always go like that to the T, but it always seems to end up on the same note. I feel like this deserves a blog post, so here it goes. The first three listings are related to “Sponsors for Educational Opportunity.” Another good one is “Student Employment Office.” Because apparently in the higher education world, that’s what SEO means. 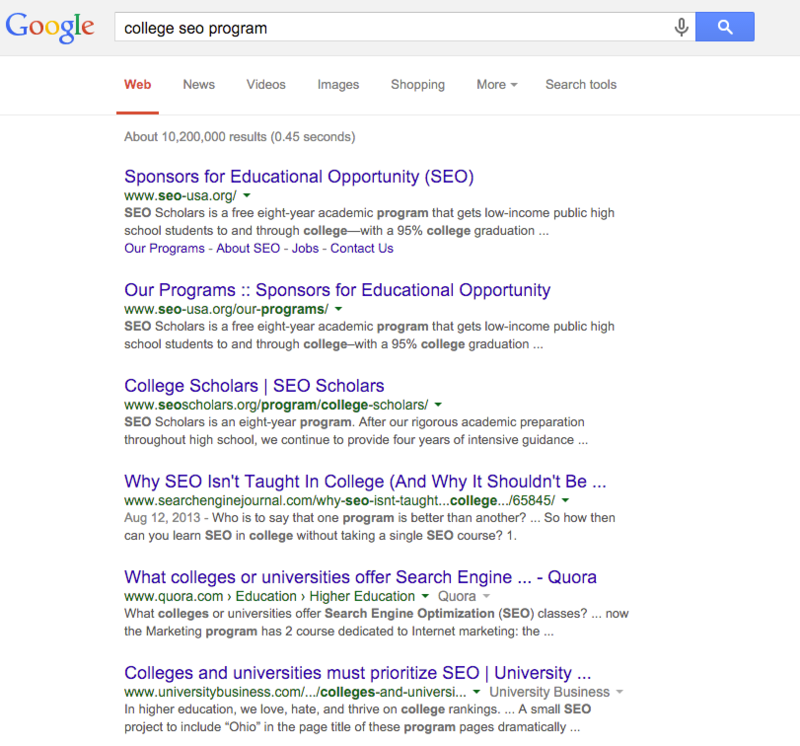 Other listings on the page talk about why SEO should or shouldn’t be taught in college, or are related to SEO strategies for colleges and universities. Didn’t click the link? I’ll make it even easier for you. Now that we’re all on the same page, I’d like to point something out. There’s not a single program here that actually teaches SEO. I’ve heard of some schools that offer classes on SEO, or industry professionals who teach extra-curricular classes on the basic principles on online marketing. But not once have I seen a curriculum that is dedicated to SEO, and I don’t think I should. Let’s say someone puts a course dedicated to SEO together. They spend thousands of hours writing a text book, putting the curriculum in place, creating assignments, working out deals with software companies to make the class affordable, and actually getting people to enroll in the class. Assuming they get this far, class can actually start. As the class goes along, tweaks and adjustments will probably need to be made to ensure the class is getting the full benefit. Let’s assume that it only takes one semester for the teacher to get most of the bugs worked out. The next semester, search engines have made a change to the way they operate and some of the curriculum becomes outdated. Rather than update it, though, this teacher may leave the information outdated, because they just streamlined their teaching process. 12 months down the road, the curriculum becomes outdated. Technology has changed, people are searching in different ways, and the curriculum was never designed to teach about app indexing, Apple’s improved Spotlight search, or how search engines handle new top level domains. So now what? Dump the existing course and start over fresh? Put another few thousand hours into a fresh text book and course where you’ve got more bugs and kinks to work out? I don’t see how it would work. The technology just moves too quickly. So What About Adjacent Programs? Well, the answer to that is simple. I believe advertising programs are becoming less relevant. Web design isn’t something I need any more knowledge of (apart from keeping on top of design trends and best practices, which I can find online). And programming/development would be an all-consuming thing. If I were going to be a developer, that’s the only thing I’d be able to focus on. What About a Degree Just to Have a Degree? I’ll be as tactful as I can in response to that one. Statements like those are huge red flags to me. I interpret them as “I care more about appearances than I care about finding the best fit for the position or the most qualified candidate.” I have no interest in working with or for someone like that. I realize this limits the number of people I might be able to work with, but I think it means the people I do work with have a much greater chance of succeeding. If you have any thoughts you’d like to share or feel like I’ve missed anything, I’m more than open to hearing it all. Get at me in the comments and let’s start a discussion! 1. I agree with you about the challenge of constructing an entire course curriculum around SEO. It would be difficult to keep 100% relevant. Unless the instructor has one foot in industry as a practitioner, there’s a low probability that they’ll think to talk about App Store optimization or other niche topics. 2. Everything else you said is junk. 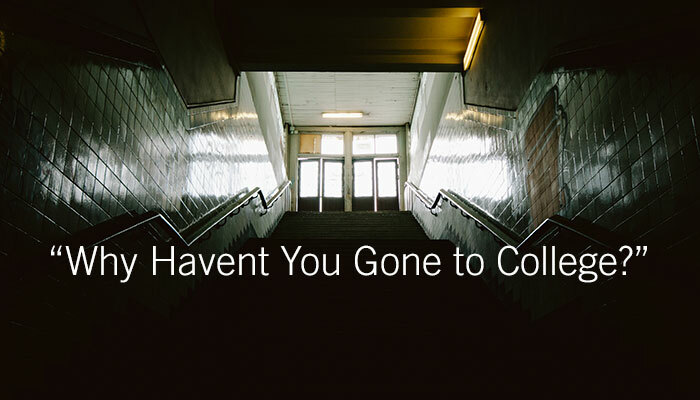 Are you harboring any weird contempt for SEOs who did go to college? Are they any less knowledgeable about SEO because of it? Do you think they picked up anything else along the way that’s going to help them in their careers, or do you want to tell them all that it was a big waste of time? Don’t worry, I still like you. I just don’t know whether you’ve thought this through enough. Scott, thanks for sharing your views. Actually, I harbor no contempt for anyone who has gone to school. If that’s the path an SEO has chosen to take, more power to them. Seriously, I don’t think anyone could reasonably say that those experiences don’t help shape someone one way or another. I should have clarified in the post, but I would actually love to go to school. No doubt I would have many experiences that would be helpful to me in my career and in life. However, when it comes down to it, that’s a very expensive way to learn things that may or may not somehow apply to the career path I’ve chosen. I also should have noted that if someone were to put the effort into creating a legitimate SEO degree, I would go to that school (almost) regardless of the cost. I could have worded the “two otherwise equal candidates,” part better. Because, let’s face reality here, no two candidates for a job are going to be entirely equal. So I’ll reword it like this – “I don’t really care what your degree is in, but if I had to choose between two candidates with a very similar background and experience, I’ll pick the one with the degree.” Whether I had a degree or not, I don’t think I’d ever get behind that kind of attitude. Now to the part where I’m extremely glad you’ve responded – I’d be really interested in hearing how teaching digital marketing at the university level is. What challenges do you face that I haven’t seen here? Apart from the ease of updating text books, what else have I completely missed the boat on? I’ll be the first to admit, I may not be seeing the whole story. Having never had the experience, how could I? Genuinely, you’re one of the best people I can think of to have this conversation with. Teaching digital at the university level is really rewarding, but I know that I often take for granted many of the things my students don’t know that I assumed were kind of intuitive. The biggest challenge is teaching students how to think strategically about something like SEO. They have to understand how it works on a technical level and they need to see it in action to have that experience for themselves. But more importantly, they have to understand the link between SEO and marketing strategy. They will be infinitely more valuable to an organization if they are trained as strategists who know how to use SEO as just one chess piece toward winning the whole game (and when to allocate more/fewer resources to it), than if we train them as pure SEO tradesmen. So for me, it’s a balance between training my students to be solid SEOs coming out of the gate and helping them get jobs vs. recognizing that most of them have no interest in becoming SEOs and that I really need to work on developing their critical thinking and decision-making skills. I’ve noticed even training SEOs that strategy is the most difficult thing for me to teach, and for them to grasp. Some people come by it naturally, but for many it takes a lot of time and effort. Have you found a way to teach critical thinking quickly or well? You’re definitely right about having a grasp on the bigger picture. I’d by lying if I said SEO is the only thing I do, and if it were I’d be severely limiting myself in terms of value and opportunity. What types of jobs do your students typically find/search for after graduation?